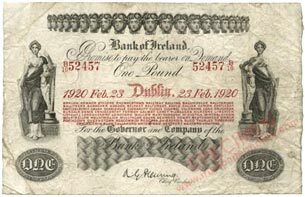 The First World War brought about increased economic activity in Ireland and with it increased money supply, mainly in the form of One Pound notes. After decades of little change, Irish banks began to modernise and alter the designs of their notes, initially by reducing the size of £1 notes. 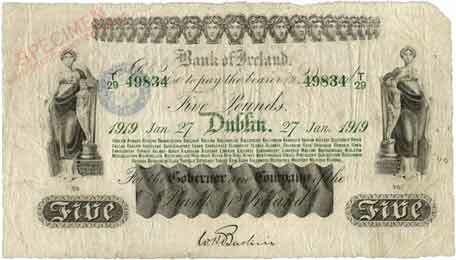 Bank of Ireland was the first bank to produce a new series of reduced size notes. 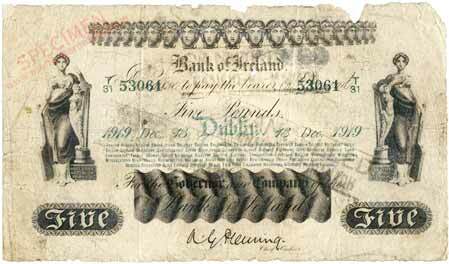 Bank of Ireland began to make alterations to its banknote issues by introducing modern style heavy bleed serial numbers with leading zeros, in place of old style script numerals with a double tilde in place of leading zeros. This change to the modern style serial numbers is a defining characteristic of Series F.
At the same time, the bank reduced the size of its £1 notes from approximately 220 x 110 mm to 150 x 100 mm, a reduction in area of slightly over 50%. £1 notes made up the vast bulk of the bank’s note production, so this size reduction represented a considerable saving in resources. Smaller notes meant that more notes per plate area could be printed. They were also likely to have been a bit more durable in circulation. Prefixes on £1 notes were also reset to start anew from A/10. The numbering box used to set the prefix and serial numbers was also reduced in size on £1 notes, making the prefix on the notes quite small. Other denomination notes remained large size and had their serial number styles modernised. On £5 notes the branch listings, date and serial numbers were printed in green ink, a change from the red previously used on all denominations. £10 notes and £20 notes printed in 1919 were unchanged from earlier issues, other than in the modernisation of their serial number styles. There are two Types by signature variation for Series F banknotes: Type A: W. H. Baskin (1918-1919); Type B: A. G. Fleming (1919-1920). These two Types divide into several variations of £1 notes and £5 notes, two for each Type. 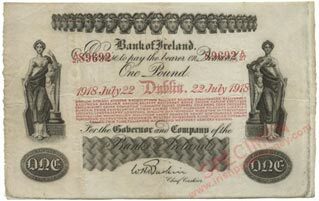 There are 143 dates for the reduced size £1 note, spread across the two signature varieties of Series F and two signature varieties of Series G. An example of each date, where available, is presented in the Bank of Ireland reduced size £1 date listing. Ultimately, the aim is to record an image of every date.